In the Wasteland Weekend world, influenced and informed by the chaos of Mad Max, you can delight in all things fiercely creative. In this fun world of ferocity, everything is meant to look vicious and menacing, from the people to the guard posts. And people’s rides are no exception to this rule — not to mention the high potential for ghoulish puns, as seen here. 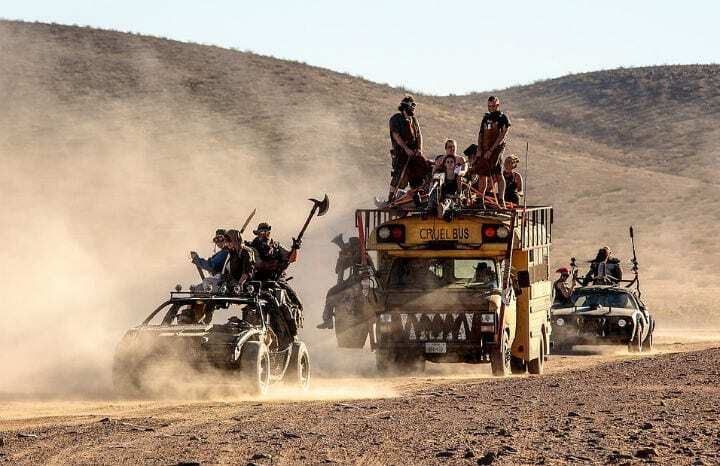 Repurposed vehicles are in fact the centerpiece of the festival, rumbling, roaring, and careening through the rocky desert with their tribesmen and women yelping battle cries. It’s not just jalopies and banged up cars, but you can find altered and souped-up ATVs, buggies, and even this school bus — with its aptly ominous moniker.